This article is about a number of exclusive, older, fee-charging schools in England and Wales for children over the age of 11 or 13. For other fee-charging schools in the United Kingdom, see Independent school (United Kingdom). For state-funded schools, see State school § United Kingdom. A public school in England and Wales is a long-established, student-selective, fee-charging independent secondary school that caters primarily for children aged between 11 or 13 and 18, and whose head teacher is a member of the Headmasters' and Headmistresses' Conference (HMC). Public refers to their origins as schools open to any public citizen who could afford to pay the fees; they are not funded from public taxes. Traditionally, English public schools were all-male boarding schools, but the term now also includes co-educational and girls' schools, while many accept day pupils as well as boarders. Public schools have had a strong association with the ruling classes. Historically, they educated the sons of the English upper and upper-middle classes. The sons of officers and senior administrators of the British Empire were educated in England while their fathers were on overseas postings. In 2010, over half of Cabinet Ministers had been educated at public schools; by contrast, most prime ministers since 1964 were educated at state schools. Public schools emerged from charity schools established to educate poor scholars—public because access to them was not restricted on the basis of religion, occupation, or home location, and that they were subject to public management or control, in contrast to private schools which were run for the personal profit of the proprietors. The origins of schools in the UK were primarily religious until 1640,[clarification needed] when House of Commons invited Comenius to England to establish and participate in an agency for the promotion of learning. It was intended that by-products of this would be the publication of 'universal' books and the setting up of schools for boys and girls. 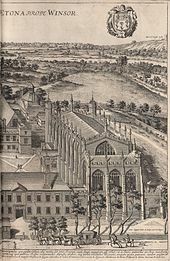 Soon after the Clarendon Commission reported in 1864, the Public Schools Act 1868 gave the following seven schools independence from direct jurisdiction or responsibility of the Crown, the established church, or the government: Charterhouse, Eton College, Harrow School, Rugby School, Shrewsbury School, Westminster School, and Winchester College. Henceforth each of these schools was to be managed by a board of governors. The following year, the headmaster of Uppingham School invited sixty to seventy of his fellow headmasters to form what became the Headmasters' Conference – later the Headmasters' and Headmistresses' Conference. Separate preparatory (or "prep") schools developed from the 1830s, which "prepared" younger boys for entry to the senior schools; as a result the latter began limiting entry to boys who had reached 12 or 13 years of age. According to the Independent Schools Information Service, a consortium set up by British independent schools to promote themselves to the public, public school is usually applied to describe the 215 independent and mainly boys' secondary schools belonging to the Headmasters' Conference. The name dates back to the time when schools founded for local children went 'public' and admitted children from further afield. It is also used to describe the some 230 girls' senior schools belonging to the Girls' Schools Association. When the "Education" section of a capsule biography in Who's Who or similar British reference works says "privately", this refers to the person having been educated by personal tutors rather than at a school. The term "public school" in American English and in Scotland, where a state-funded education system began roughly 300 years prior to England's, means something quite different: one administered by the local government to serve the children of that area. Until the late medieval period most schools were controlled by the church and had specific entrance criteria; others were restricted to the sons of members of guilds, trades or livery companies. The need for professional trades in an increasingly secularised society required schools for the sons of the gentry that were independent from ecclesiastical authority and open to all. From the 16th century onward, boys' boarding schools were founded or endowed for public use. Traditionally, most of these public schools were all boys and full boarding. Some public schools are particularly old, such as The King's School, Canterbury (founded 597), The King's School, Rochester (founded 604), St Peter's School, York (founded c. 627), Sherborne School (founded c. 710, refounded 1550 by Edward VI), Warwick School (c. 914), The King's School, Ely (c. 970) and St Albans School (948). These schools were founded as part of the church and were under their complete dominion. Separate preparatory schools (or "prep schools") for younger boys developed from the 1830s, with entry to the senior schools becoming limited to boys of at least 12 or 13 years old. The first of these was Windlesham House School, established with support from Thomas Arnold, headmaster of Rugby School. Many of the schools, including Rugby School, Harrow School and the Perse School fell into decline during the 18th century and nearly closed in the early 19th century. Protests in the local newspaper forced governors of the Perse School to keep it open, and a court case in 1837 required reform of the abuse of the school's trust. A Royal Commission, the Clarendon Commission (1861–1864), investigated nine of the more established schools, including seven boarding schools (Charterhouse, Eton, Harrow, Rugby, Shrewsbury, Westminster and Winchester) and two day schools (St Paul's and the Merchant Taylors'). The Public Schools Act 1868 regulated and reformed these "public schools", for which it provided the first legal definition: schools which were open to the paying public from anywhere in the country, as opposed to, for example, a local school only open to local residents, or a religious school open only to members of a certain church. St Paul's School and the Merchant Taylors' School claimed successfully that their constitutions made them "private" schools, and were excluded from the requirements of this legislation. In 1887 the Divisional Court and the Court of Appeal determined that the City of London School was a public school. Following the Clarendon Commission, the Taunton Commission was appointed to examine the remaining 782 endowed grammar schools, and produced recommendations to restructure their endowments; these recommendations were included, in modified form, in the Endowed Schools Act 1869. In that year, the headmaster of Uppingham School wrote to 37 other headmasters of what he considered leading boys' schools not covered by the Public Schools Act, inviting them to meet annually to address the threat posed by the Endowed Schools Act. In the first year only 12 headmasters attended, but in the following year 34 did, including the Clarendon schools. The Headmasters' Conference (HMC, now the Headmasters' and Headmistresses' Conference) has since grown steadily to over 200 schools. The Public Schools Yearbook was published for the first time in 1889, listing 30 schools, mostly boarding schools except for St Paul's School and Merchant Taylors' School. Some academically successful grammar schools were added in later editions. 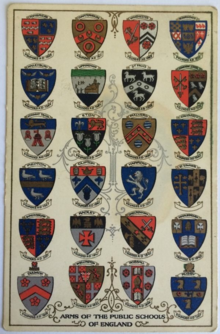 The 1902 edition included all schools whose principals qualified for membership of the Headmasters' Conference. The Fleming Committee recommended that one-quarter of the places at public schools should be assigned to a national bursary scheme for children who would benefit from boarding. The key advocate was Ellen Wilkinson, but it got off to a slow start in an age of severe budget constraints. The Conservative Government elected in 1951 did not expand the programme. It failed because it was not a high priority for either party, money was tight, there was wavering support from independent boarding schools and local education authorities, and no consensus was reached on how to select the pupils to participate. The 1968 film if...., which satirised the worst elements of English public school life, and culminated in scenes of armed insurrection, won the Palme d'Or at the 1969 Cannes Film Festival. These actions were felt in British public schools; the new headmaster at Oundle School noted that "student protests and intellectual ferment were challenging the status quo". These challenges coincided with the mid-1970s recession and moves by the Labour government to separate more clearly the independent and state sectors. When the direct grant was abolished in 1975, the HMC schools within the scheme became fully independent. At the same time, local authorities were ordered to cease funding places at independent schools, which accounted for over 25% of places at 56 schools, and over half at 22 of them. In addition, between 1975 and 1983 various local authorities withdrew funding from 11 voluntary-aided grammar schools, which became independent schools and full members of the HMC. [a] The loss of state-funded places at all of these schools, coinciding with the recession, put them under severe financial strain, and many became co-educational in order to survive. The direct grant was partially revived between 1981 and 1997 in the Assisted Places Scheme, which provided support for 80,000 pupils attending private schools. Many boarding schools started to admit day pupils for the first time, and others abolished boarding completely. Some started accepting girls in the sixth form, while others became fully co-educational. The system of fagging, whereby younger pupils were required to act to some extent as personal servants to the most senior boys, was phased out during the 1970s and 1980s. Corporal punishment, which was outlawed in state schools in 1986, had been abandoned in most public schools by the time it was formally banned in independent schools in 1999 for England and Wales (2000 in Scotland and 2003 in Northern Ireland). More than half of HMC schools are now either partially or fully co-educational. 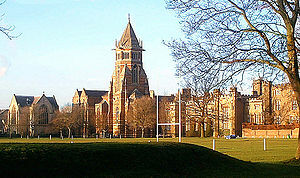 Of the Clarendon nine, two are fully co-educational (Rugby and Shrewsbury), two admit girls to the sixth form only (Charterhouse and Westminster), two remain as boys-only day schools (St Paul's and Merchant Taylors') and three retain the full-boarding, boys-only tradition (Eton, Harrow and Winchester). The newest public school to join the HMC is Yarm School, which was founded in 1978. The majority of public schools are affiliated with, or were established by, a Christian denomination, principally the Church of England, but in some cases the Roman Catholic and Methodist churches; or else identify themselves as "non-denominational Christian". A small number are inherently secular, most notably Oswestry School. Harrow graduate Stanley Baldwin wrote that when he became Prime Minister before World War II, he wanted to have six Harrovians in his government: "To make a cabinet is like making a jig-saw puzzle fit, and I managed to make my six fit by keeping the post of Chancellor of the Exchequer for myself". Up to the war, the role of public schools in preparing pupils for the gentlemanly elite meant that such education, particularly in its classical focus and social mannerism[clarification needed], became a mark of the ruling class. For three hundred years, the officers and senior administrators of the British Empire usually sent their sons back home to boarding schools for education as gentlemen, often for uninterrupted periods of a year or more at a time. The 19th-century public school ethos promoted ideas of service to Crown and Empire, understood by the broader public in familiar sentiments such as "it's not whether you win or lose, it's how you play the game" and "the Battle of Waterloo was won on the playing fields of Eton" – the latter sometimes but probably wrongly attributed to Wellington. Many ex-pupils, like those from other schools, had, and still have, a nostalgic affection for their old schools (George Orwell remembered being "interested and happy" at Eton,) and a public school tie and "old boy network" of former pupils could be useful in a career. The English public school model influenced the 19th-century development of Scottish private schools, but a tradition of the gentry sharing primary education with their tenants kept Scotland comparatively egalitarian. Acceptance of social elitism was reduced by the two world wars, but despite portrayals of the products of public schools as "silly asses" and "toffs", the old "system" at its most pervasive continued well into the 1960s, reflected in contemporary popular fiction such as Len Deighton's The IPCRESS File, with its sub-text of supposed tension between the grammar school educated protagonist and the public school background of his more senior but inept colleague. 2009 photograph of UK Leader of the Opposition and future Prime Minister David Cameron (left), Lib Dem spokesman and future Secretary of State for Energy and Climate Change Chris Huhne (centre) and Lib Dem leader and future Deputy Prime Minister Nick Clegg (centre right), all of whom had attended English public schools. Postwar social change has, however, gradually been reflected across Britain's educational system, while at the same time fears of problems with state education have pushed some parents, who can afford the fees or whose pupils qualify for bursaries or scholarships, towards public schools and other schools in the independent sector. In 2009 typical fees were up to £30,000 per annum for boarders. 19 Prime Ministers have attended Eton, seven Harrow, and six Westminster. Between 2010 and 2016, Prime Minister David Cameron (Eton) and Chancellor of the Exchequer George Osborne (St Paul's) had both been educated at Clarendon schools. However, while the outgoing Conservative Prime Minister in 1964 (Douglas-Home) had been educated at Eton College and the incoming Labour Prime Minister in 1997 (Blair) had been at Fettes College, all six British Prime Ministers in office between 1964 and 1997 and 2007 to 2010 were educated at state schools (Wilson, Heath, Thatcher, and Major at grammar schools and Callaghan and Brown at other state secondary schools). Current Prime Minister Theresa May's secondary school education also was primarily in the state sector. While members of the aristocracy and landed gentry no longer dominate independent schools, several studies have shown that such schools still retain a degree of influence over the country's professional and social elite despite educating less than 10% of the population. A 2012 study published by the Sutton Trust noted that 44% of the 7,637 individuals examined whose names appeared in the birthday lists of The Times, The Sunday Times, The Independent or The Independent on Sunday during 2011 – across all sectors, including politics, business, the arts and the armed forces – were educated at independent or private schools. It also found that 10 elite fee-paying schools (specifically Eton, Winchester, Charterhouse, Rugby, Westminster, Marlborough, Dulwich, Harrow, St Paul's, Wellington) produced 12% of the leading high-flyers examined in the study. The Social Mobility and Child Poverty Commission came to a similar conclusion in a 2014 study of the professions: 71% of senior judges, 62% of senior armed forces officers, 55% of Whitehall permanent secretaries and 50% of members of the House of Lords had been privately educated. Public schools (especially boarding schools) have sometimes been light-heartedly compared by their pupils or ex-pupils to prisons. O. G. S. Crawford stated that he had been "far less unhappy" when incarcerated in Holzminden prisoner-of-war camp during the First World War than he had previously been at his public school, Marlborough College. Evelyn Waugh observed in his satirical novel Decline and Fall (1928) that "anyone who has been to an English public school will always feel comparatively at home in prison". Former Cabinet Minister Jonathan Aitken, sentenced to 18 months' imprisonment for perjury in 1999, commented in an interview: "As far as the physical miseries go, I am sure I will cope. I lived at Eton in the 1950s and I know all about life in uncomfortable quarters." In 2018, it was reported that average fee levels at private schools in England had risen above £17,000 per annum for the first time. ^ There were 13 such schools, but two were girls' schools, and thus ineligible for HMC membership. ^ a b Independent Schools: The Facts, Independent Schools Information Service, 1981. ^ "Education in England - Chapter 1". www.educationengland.org.uk. ^ Oxford English Dictionary, June 2010. ^ "The History of Windlesham House School" (PDF). Windlesham House School. ^ "History of British Preparatory School". ^ "History – Almost 400 years old". The Perse School. ^ Shrosbree (1988), p. 12. ^ "Education in England: a brief history". Education in England. ^ Shrosbree (1988), p. 118. ^ Blake v The Mayor and Citizens of the City of London  L.R. 19 Q.B.D. 79. ^ Walford (1986), pp. 7–8. ^ Honey (1977), pp. 250–251. ^ Fleming (1944), p. 1. ^ Donnison (1970), p. 49. ^ Donnison (1970), pp. 72-73. ^ Nicholas Hillman, "Public schools and the Fleming report of 1944: shunting the first-class carriage on to an immense siding?." History of Education 41#2 (2012): 235-255. ^ "Festival de Cannes: If..." festival-cannes.com. Retrieved 6 April 2009. ^ "Headmaster Dr Barry Trapnell CBE (1924–2012)". Oundle School. Archived from the original on 5 May 2013. Retrieved 27 April 2013. ^ a b c Walford (1986), p. 149. ^ Donnison (1970), pp. 81, 91. ^ Dr Rhodes Boyson, Under-Secretary of State for Education (2 July 1979). "Schools (Reorganisation)". Parliamentary Debates (Hansard). House of Commons. col. 486W. ^ Dr. Rhodes Boyson, Under-Secretary of State for Education (5 November 1980). "Schools (Status)". Parliamentary Debates (Hansard). House of Commons. col. 579W. ^ Mr Clement Freud, MP for Isle of Ely (29 January 1981). "Education (Cambridgeshire)". Parliamentary Debates (Hansard). House of Commons. col. 1151. ^ "The main elements of the Queen's Speech on May 14, 1997 upon the two Education Bills". BBC Politics 1997. Archived from the original on 18 June 2011. Retrieved 19 June 2011. ^ Sampson (1971), p. 132. ^ Walford (1986), p. 244. ^ Walford (1986), pp. 141–144. ^ Walford (1989), pp. 82–83. ^ "Corporal punishment banned for all". BBC News. ^ "Corporal punishment in schools – United Kingdom". ^ Walford (1986), pp. 141–142. ^ St Paul's admits a small number of boarders. ^ Gunther, John (1940). Inside Europe. New York: Harper & Brothers. p. 286. ^ P.J. Cain; A. G. Hopkins (2016). British Imperialism: 1688-2015. Routledge. p. 724. ^ "ISC Annual Census 2009". Independent Schools Council. 29 April 2009. Archived from the original on 6 December 2009. ^ The Educational Backgrounds of Government Ministers in 2010 Sutton Trust, 2010. ^ "How politics got 'posh' again". The Daily Telegraph. 23 January 2011. Retrieved 9 May 2012. ^ "Resignations fuel fears of posh-boy politics". The New Zealand Herald. 26 January 2011. Retrieved 9 May 2012. ^ a b "The Educational Backgrounds of the Nation's Leading People" (PDF). Sutton Trust. November 2012. ^ "Public schools retain grip on Britain's elite". The Daily Telegraph. 20 November 2012. ^ Arnett, George (28 August 2014). "Elitism in Britain - breakdown by profession". The Guardian. ^ Crawford, O.G.S. (1955). Said and Done: the Autobiography of an Archaeologist. London: Weidenfeld and Nicolson. pp. 26, 142–3. ^ "Jonathan Aitken quotes". izquotes.com. Retrieved 5 March 2013. ^ Adams, Richard (26 April 2018). "Average private school fees rise above £17,000 a year for first time". the Guardian. The Guardian. Allsobrook, D. I. "The reform of the endowed schools: the work of the Northamptonshire Educational Society, 1854-1874", History of Education (1973) 2#1 pp 35-55. Bamford, T.W. The Rise of the Public Schools: A Study of boys’ Public Boarding Schools in England and Wales from 1837 to the Present Day (1967). Benson, A. C. (2011) . The Schoolmaster. Peridot Press. ISBN 978-1-908095-30-5. Bishop, T.J.H. and Wilkinson, R. Winchester and the Public School Élite: A Statistical Analysis (1967). Carman, Dominic (2013). Heads Up: the challenges facing England's leading head teachers. London, UK: Thistle Publishing. ISBN 978-1909869301. Dishon, Gideon. "Games of character: team sports, games, and character development in Victorian public schools, 1850–1900." Paedagogica Historica (2017): 1-17. Mack, Edward Clarence (1941). Public Schools and British Opinion since 1860: the relationship between contemporary ideas and the evolution of an English institution. New York: Columbia University Press. Donnison, David, ed. (1970), Report on Independent Day Schools and Direct Grant Grammar Schools, Public Schools Commission, Second Report, London: Her Majesty's Stationery Office, ISBN 978-0-11-270170-5. Newsom, John, ed. (1963), Half Our Future, London: Her Majesty's Stationery Office. Spens, Will, ed. (1938), Secondary education with special reference to grammar schools and technical high schools, London: HM Stationery Office, retrieved 23 April 2013.